Show your support for the Doggies when you pull on this Canterbury Bulldogs NRL 2018 Home S/S Replica Rugby Shirt in White and Blue from Canterbury. This rugby shirt from NRL side, the Canterbury Bulldogs comes in the traditional white and blue. 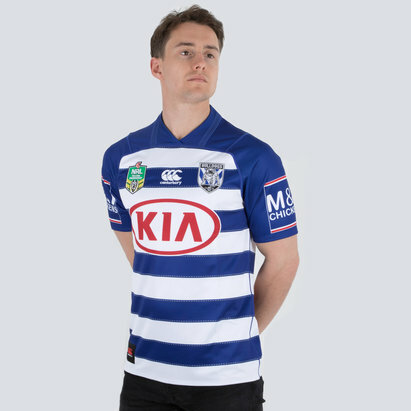 All of the sponsors logos have been sublimated into the design, but the NRL League, kit supplier Canterbury, and the famous Bulldogs logo have been embroidered upon the jersey. Made from 100% polyester and this lightweight shirt features Canterbury's loop collar for added comfort. The design sees chevrons upon the chest, a design that's synonymous with rugby league. 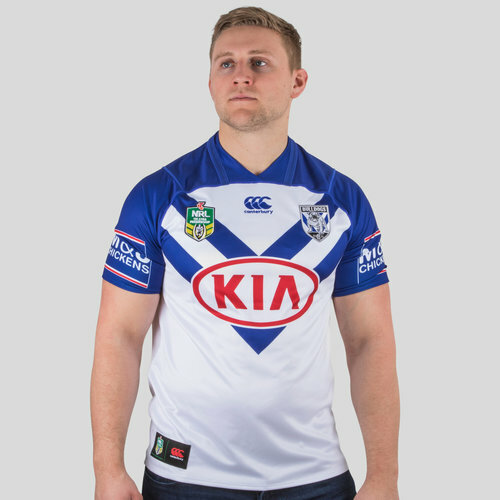 Like James Graham and the rest of the Bulldogs squad, pull on this Canterbury Bulldogs NRL 2018 Home S/S Replica Rugby Shirt.